That Face-Lift May Buy You Only Three Years Of Youth : Shots - Health News There's little research objectively measuring the aesthetic benefits of cosmetic surgery. In one study, people were considered by outside observers to be no more attractive after having face-lifts and other procedures, though they were judged to look a bit younger. The lighting in the NPR newsroom isn't doing me any favors. Maybe it's time to get some "work" done? 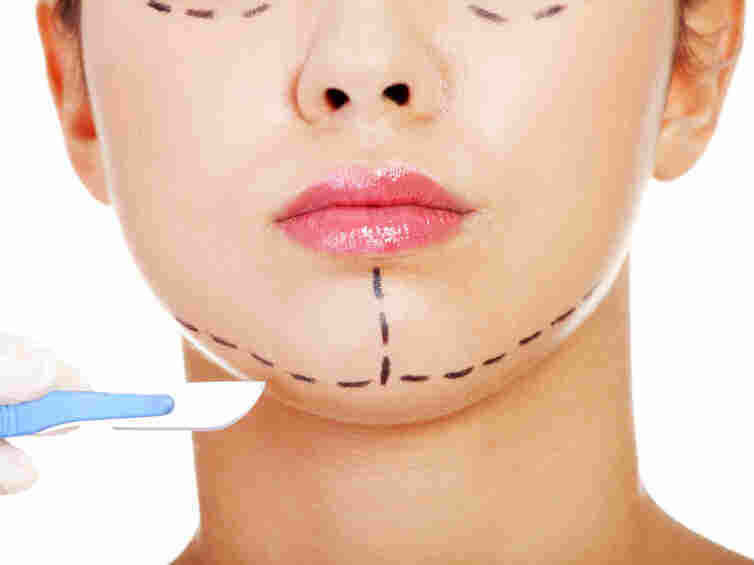 Then again, cosmetic surgery makes people look only about three years younger and no more attractive, according to a study that tries to add some objectivity to a very subjective field of medicine. The researchers took before and after photos of 49 people who underwent facial cosmetic surgery at a private practice in Toronto. The patients ranged in age from 42 to 73. Some had face-lifts and neck-lifts; others had brow-lifts or had their eyelids done. Independent raters were given photos and asked to guess the ages of the people and rate their attractiveness on a 1 to 10 scale. None of the raters had before and after photos of the same person, so they couldn't compare surgery's effects on an individual. The raters guessed the people were two years younger on average before surgery than they were in real life, and five years younger after surgery. There was no significant difference in attractiveness scores. The results were published online in the journal JAMA Facial Plastic Surgery. Three years of purchased juvenescence doesn't sound like such a great deal, especially when a face-lift can cost $10,000 to $20,000 once you add surgeon and hospital fees. That's at least $3,000 for each extra year of nipped and tucked "youth." So I called the study's lead author, Joshua Zimm, to learn more. Zimm's now an attending surgeon at Lenox Hill Hospital in New York, and also has a private practice on New York's tony Upper East Side, so he knows all about client expectations. This study was prompted by a "dearth of objective measurements in the literature," Zimm says, that made it hard for cosmetic surgeons to quantify the benefits of their art. "We think people will look younger, but we don't typically tell people that because we don't want to create unrealistic expectations." Instead, he says, a plastic surgeon will tell a prospective patient that they will look " 'more refreshed' or 'less tired.' We don't usually use the buzzwords 'You're going to look X percentage points younger or X percentage points more attractive.' "
But wouldn't it be nice if they could? Zimm says he and his colleagues were surprised that the improvements in age weren't greater. But that could be due to a number of factors, he says, including the fact that the people in the study had different procedures. "You're not going to see as dramatic improvements in age or attractiveness with a brow-lift," he explains, in comparison to a lift of both the face and the neck. "I think that could have brought down our numbers." One of the few other studies that tried to objectively quantify improvements in appearance found that people who had face-lifts looked seven years younger. Zimm and his colleagues plan to continue the research, refining their study design. The gold standard, he says, would be to compare results of multiple surgeons doing the same procedure. "That's the ideal." But in the meantime, people contemplating a touch-up are left with little more than those before and after photos in cosmetic surgery ads. And how reliable are those? "Typically when you see these before and afters, you're going to see the surgeon's best results," Zimm says. "You're not going to see his average results. You're not going to see his mediocre results." The ads can give people false hope, Zimm adds, given that the face the surgeon will have to work with may look nothing like the one in the ad. "Your surgeon should explain this all, and set the stage for realistic expectations."